As Jim Davila points out, there is now an official recommendation by the Israel Antiquities Authority to move the prison and preserve the site of the newly discovered Christian mosaics and possible church. Two other recent articles in the Jerusalem Post and on Haaretz.com discuss this same development. If IAA’s recommendation is followed, this is good news for further archeological study and preservation of the site. Categories: Megiddo Christian mosaics series. January 29, 2006 . There are two recent articles of note on the Megiddo find. Categories: Archeology and epigraphy, Megiddo Christian mosaics series. December 16, 2005 . 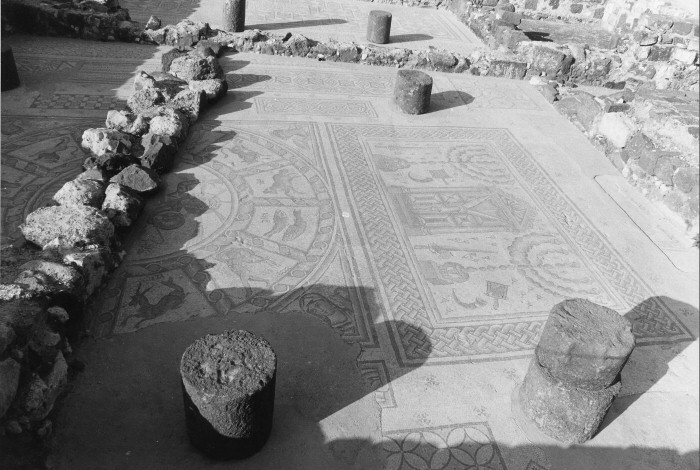 In a recent email, one reader asked about the two fish depicted in the Megiddo mosaics, and wondered whether there may be any connection to astrology and pisces. 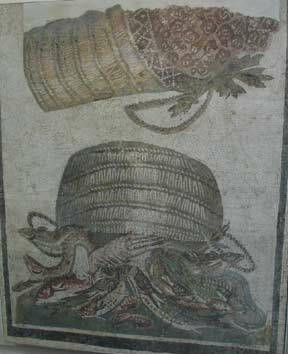 I thought I’d take this opportunity to discuss some examples of sea-creatures in Greco-Roman art and to post a few photos (or links to photos) to illustrate (when else might I have the opportunity to use photos of fish?). It is very true that there are other mosaics in which two fish are depicted in a similar manner in reference to pisces, but in the context of other signs of the zodiac. See, for instance, the two fish depicted alongside other signs of the zodiac in a third-century mosaic now in the Bardo Museum in Tunisia (also described here), or the two fish in the mosaic from a synagogue at Hammat Tiberias in the Galilee (another photo here; fourth-fifth century CE). The latter is just one among the examples of the zodiac in Jewish synagogue art (see, for instance, the description of the Sepphoris synagogue mosaic here). 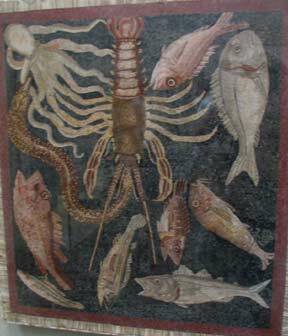 Setting aside astrological symbols specifically, fish and other sea creatures were also common within Greco-Roman (“pagan”) art in other ways. Here I have posted a few photos I took in the British museum. Some are focussed on the fish themselves, as in the early second-century mosaic with a lobster and fish from Papalonia, near Rome (above). 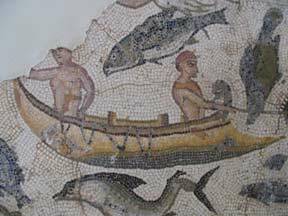 Other mosaics depict actual hunting and fishing scenes, as in the third century mosaic from North Africa (right). In still other cases fish are depicted in scenes of abundant food, as in the first or second century mosaic from Carthage, likely from a dining-room (triclinium), which depicts a basket of fish alongside a basket of fruit (see below). Quite well known, of course, is the fact that early Christians attached special significance to the symbol of the fish, which may directly relate to the Christian mosaics which have been uncovered at Megiddo. There are numerous stories involving fish in the gospels, with the most obvious being Jesus’ multiplication of the fish and loaves to feed thousands. The disciples, some of whom were literally fishermen, are characterized as fishers of people in the gospels as well. Gradually, the fish also became associated with other specifically Christian rituals, including the thanksgiving meal (eucharist) and baptism. Tertullian, for instance, speaks of Christians as fish following the chief fish (ΙΧΘΥΣ) Jesus Christ in connection with baptism: “But we, being little fishes, as Jesus Christ is our great Fish, begin our life in the water, and only while we abide in the water are we safe and sound” (On Baptism 1; trans by Ernest Evans, online here). Tertullian may here be alluding to the fact that the Greek word for “fish”, ΙΧΘΥΣ, was used by some Christians as an acrostic for “Jesus Christ, Son of God, Saviour”, with each letter representing part of this name / title (cf. Sibylline Oracles 8:217-250). Fish commonly appear in Christian funerary art of the third and following centuries, sometimes alongside other symbols which were given a Christian meaning, including the anchor. This Christian understanding of the symbol may be primary in the Megiddo case (if no other zodiacal symbols are found). Yet it is worth mentioning the possibility that the (non-Christian?) artist hired to create the mosaic may well have had in his mind the model of pisces as commonly depicted in other mosaics. For further discussion of fish in Greco-Roman, Jewish, and Christian art, see Erwin R. Goodenough’s Jewish Symbols in the Greco-Roman Period and Graydon Snyder’s Ante Pacem: Archaeological Evidence of Church Life Before Constantine. Categories: Archeology and epigraphy, Art and religion, Megiddo Christian mosaics series. November 29, 2005 . In earlier posts, I have discussed the new find of Christian mosaic inscriptions in the yard of the Megiddo prison. There is now further information regarding the discovery in an article titled “A latter-day Gog and Magog?” in Haaretz.com (thanks to Jim Davila for the tip, who found out on Archeologica News). The year 325 is when Christianity was declared the official religion in the Roman Empire. Until then, the Christians in Palestine, as in the rest of the empire, were compelled to carry out the rituals of their religion in secret. IAA officials explain that the fact that the inscription mentions a “table” and not an “altar” indicates that it was written when Christianity operated “underground” and conducted its rituals around simple tables rather than altars, as was customary thereafter. These latter statements regarding secretive or underground activities are somewhat misleading if applied generally to Christians in the Roman empire. It was only in specific periods of persecution by the Roman state in 250 CE (under emperor Decius) and then from 303-305 CE (under emperor Diocletian) that Christians were actively sought by the Roman authorities. In general, there was no need for Christians to engage in their activities “in secret”, though they were not fully “public” either. Though they were disliked (and locally persecuted from time to time by fellow-inhabitants) for their failure to honour the gods of the Greeks and Romans, Christian groups, like many pagan groups or associations, lived their lives largely unbothered by Roman authorities unless they were involved in larger civic unrest or riots. There are four pictures and three Greek inscriptions on the floor discovered at Megiddo. Based on these findings, IAA archaeologists assume that these are the remains of a church that dates back before the year 325. Prof. Leah Di Segni, an expert on ancient inscriptions from the Hebrew University of Jerusalem, who deciphered and translated the texts found at Megiddo, supports their assumption, but also stated that a more precise dating could only be done after additional remains are uncovered. Additional artifacts are apparently buried under the stratum where the floor was found. Di Segni has determined that the formulation of the inscriptions and the form of their letters testify to the fact that they were written prior to the declaration of Christianity as a legitimate religion in the Roman Empire. Meanwhile, the IAA has decided to transfer the mosaic to its laboratories to conduct vital maintenance and preservation work, but they made a point of emphasizing that this was only a temporary move and that the floor would be returned to its original spot after this work is completed. . . The decision concerning whether to turn the Megiddo area into an international tourist site or to keep the prison there will ultimately be made by the government. Categories: Archeology and epigraphy, Megiddo Christian mosaics series. November 28, 2005 . Jean Véronis now has a discussion (in both French and English) on the “sacred names” of the Megiddo mosaic inscriptions at his blog, “Technologies du Langage”: Ecriture: La Nomina Sacra sous la prison. Categories: Archeology and epigraphy, Megiddo Christian mosaics series. November 16, 2005 . There are now other more detailed stories emerging (along with some nice photos) in connection with the new find of Christian mosaic inscriptions in the Megiddo prison yard. Go to post no. 1 in this series and scroll down to the updates. UPDATE: Also see the comments section of this post, where I address a reader’s questions regarding the so called nomina sacra (“sacred names”) abbreviations which do appear in one of the Megiddo inscriptions and which may have an impact on the question of dating. Nov 16.: Jean Véronis now has a discussion (in French) on “sacred names”: Ecriture: La Nomina Sacra sous la prison. Categories: Archeology and epigraphy, Megiddo Christian mosaics series. November 8, 2005 . The northern inscription mentions a Roman army officer who donated the money to build the floor. The eastern inscription commemorates four women, and the western inscription mentions a woman by the name of Ekeptos (sic), who ‘donated this table to the God Jesus Christ in commemoration.’ The mosaic also contains geometric patterns and a medallion with a fish design.” [We now know that the name is Akeptous, not Ekeptos, as in the photos and in the Washington Post article discussed below]. The story bills this as potentially the earliest church building ever found, but supplies little support for this suggestion. I will try to keep an eye on this story to see if more substantial and reliable information comes forth. Tepper said the most important evidence comes from three inscriptions found in the mosaics. Along the edge of the largest mosaic, featuring at its center the early Christian symbol of two fish, an ancient Greek inscription, roughly translated, reads: ‘Gaianos, also called Porphyrio, centurion, our brother, having sought honor with his own money, has made this mosaic. Brouti has carried out the work.’ Tepper said the inscription refers to a Roman officer — many officers were early converts to Christianity — who financed the structure’s construction. An inscription on a second mosaic, closer to the base of a pedestal whose use archaeologists have not determined, recalls by name four women from the community. Tepper said the third inscription is the most archaeologically valuable. It reads: ‘The God-loving Aketous (sic) has offered this table to the God Jesus Christ, as a memorial. '” [The name on the inscription is Akeptous, with a “p”]. FURTHER UPDATE (Nov. 8): National Geographic online now has three excellent pictures of the mosaics, available here. Also go to the comments section of post no. 2 in this series for my answer to a reader’s question regarding the abbreviations for God and Jesus Christ (so called nomina sacra, or “sacred names”), which are used in at least one of the inscriptions mentioned above. The use of the abbreviated “sacred names” (with the horizontal line over the abbreviation) here suggests that the inscription likely dates to the fourth century or later (but the third century is not impossible). FURTHER UPDATE (Nov. 10): Over at novumtestamentum.com, Brandon Wason has taken the time to transcribe the Greek of the Akeptous inscription, providing his own translation and some initial commentary. Categories: Archeology and epigraphy, Megiddo Christian mosaics series. November 6, 2005 .